Qumran is a deserted area at the northwest corner of the Dead Sea. Its cliffs are dotted with caves. 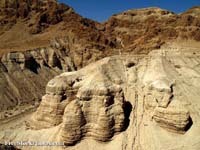 In 1947 a young Bedouin boy discovered ancient scrolls, in one of the caves, that became known as the "Dead Sea Scrolls". The scrolls included a variety of writings, including some copies of Old Testament Biblical texts. The scrolls do not include any Christian or New Testament texts. Excavations of the area have uncovered remains from 5 periods when Qumran was inhabited. At one time, the Essenes lived there, transcribing texts from the Bible. Some of these texts date back to 200 BC. Also a continued search of the caves in the area found scrolls of almost every Book in the Old Testament. When Titus and his Roman legions arrived at Jericho, the Essenes hid the scrolls in nearby caves and fled. The dry desert air kept their secret for almost 2000 years. The scrolls from Qumran are now housed in the Shrine of the Book at the Israel museum in Jerusalem.